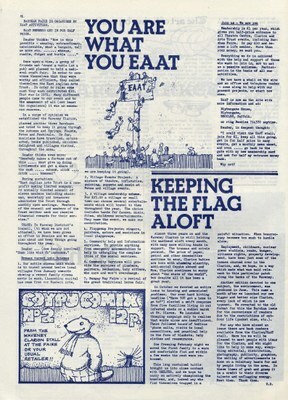 EAAT was the formal structure of the fairs scene. Formed in 1971 with the intention of developing an arts centre. Barsham Medieval Faire planned as a main fund raiser. Once upon a time, a group of friends sat round a table (at a pub) and planned to hold a mediaeval craft fair. 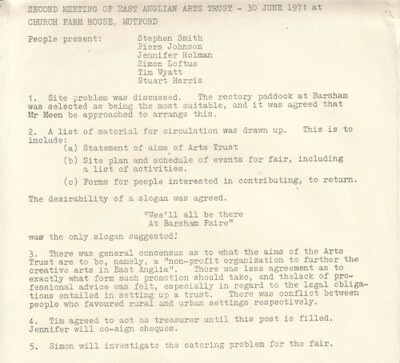 In order to convince themselves that they were worthy and efficient, they called themselves the East Anglian Arts Trust. In order to raise some cash they each contributed £10. This was in 1971. 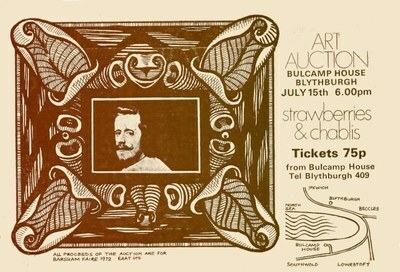 In 1972 they held an art auction to raise more cash, with which, together with hope, enthusiasm and luck, they mounted the first Barsham Faire. To the amazement of all (not least the organisers) this was an enormous success. 1973 opened with a performance by the Lowestoft Theatre Centre of their amazing 'Alice' at Beccles, with free buses provided from outlying villages. In April, we subsidised the Lowestoft SAP Festival (films, dance, music, theatre) and celebrated spring at Beccles with more music and dancing. We contributed to the Norwich Folk Festival and the Clarion Travelling Circus which spread anarchy and excitement through events at village hails, In August, Bungay survived a day-long open-air folk/rock concert and later that month twenty-two thousand people came to the second Barsham Faire, Over three magical days, we combined crafts, music, theatre, food, drink, games, fireworks, animals and people in a festival of summer delights. With the profits we played cricket and bought a van for the Lowestoft Theatre Centre. In 1975 the Lowestoft Theatre Centre's production of "Toad in a Hole" was seen by many more, thanks to our free buses. We published a Craft Directory and helped with the publication of Richard Morgan and Paul Fitzgerald's children's book "Tom the Ferryman". We also gave some cash to the Norwich community magazine "Doris". The Waveney Clarion flourishes despite numerous crises and a second edition of Coypu Comix is on the way. We are helping guitarist Steve Holmes to go to Spain to learn flamenco from the gypsies and we celebrated spring at Beccles with much dancing. Many projects are on the way and (thanks to the Waveney District Council), we finally have an office and a telephone. "East Anglian Arts Trust is a non-profit making limited company. An annually elected council of eleven members including chairman, secretary and treasurer administer the Trust through monthly open meetings. Members of the council and members of the Trust neither seek nor receive financial rewards for their service."